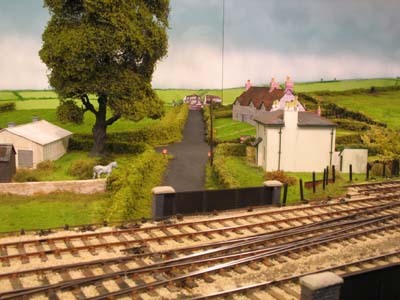 Pictured at Railwells 2001, with Tim on the station box. 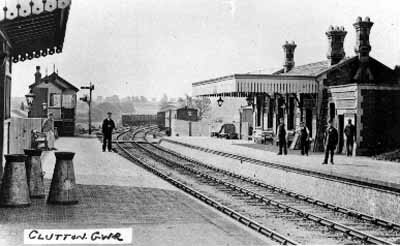 On the extreme right is the only surviving prototype building, the weigh house in the station yard. 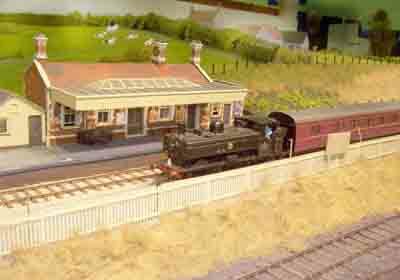 Clutton station is a personal project by Tim Venton. 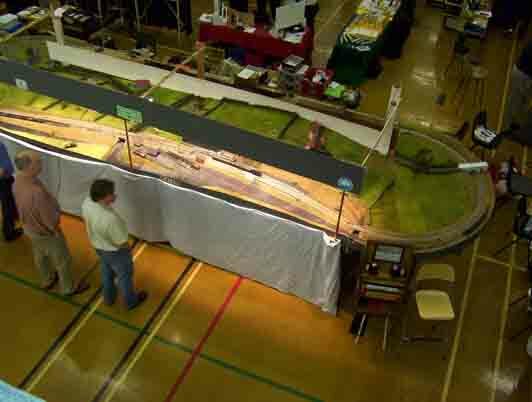 It is built to P4 (18.83mm gauge, 4mm scale) standards in a space 24' x 7'. Clutton is a passing station on the Great Western branch from Bristol to Frome between Pensford and Hallatrow. I have set the period as post-1948 BR WR but pre-1956 when the last station master retired. I will say that I have had to compress the model from approximately 21' long down to 16' (of station area) to get it into the available space. I worked on the premise when I started it, that if in the future I moved, I could rely on getting a typical garage space approximately 16'6" by 7'. As such, Clutton could fit in there, with the doors open. Well I did move and was fortunate to obtain a garage of considerable size (for Britain), kicking the car out gives me a space some 23' by 17'. The layout will just fit in diagonally. 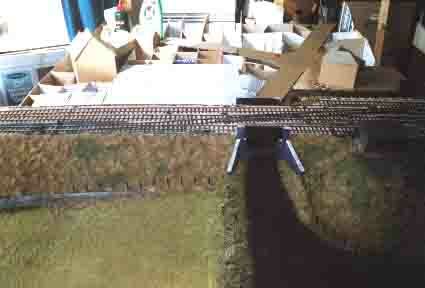 The layout is continuous, with the fiddle yard around the back. For operation, the operators stand behind the layout, but the lever frame operator sits out the front. Communication between them is via block bells. Layout plan: approximately 24' long, and 7' deep. The inside of the layout is not open, the operators stand behind. A signal box operator usually sits on the bottom right corner. That person has the normal signalman responsibilities. The train drivers are diagonally opposite, and for shunting purposes, have control over the yard points. It's a big project. Baseboards are built of stressed plywood, supported on a ladder subframe. This means that the 24' of layout is supported on 5 trestles. Trackwork comprises individual plastic chairs glued onto plywood sleepers. I may add some details of track construction, when time permits. All signals, including the ground signals and the running line points, are worked by the interlocked lever frame, which represents the actual frame in Clutton Signal Box. The main signals even bounce (when they feel like it). The single main lines are controlled by representations of the electric key token instruments. These are interconnected with the lever frame, and used to control the electrical circuits that powered the trains. A few years ago I adopted DCC (Digital Command Control). 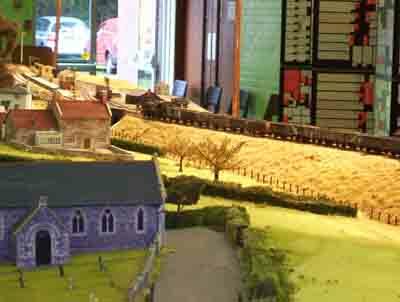 Setting aside the 'gimmicks' of double heading, banking etc, what DCC brings for me is route setting in the fiddle yard. At last it is possible to sit down to operate the layout. 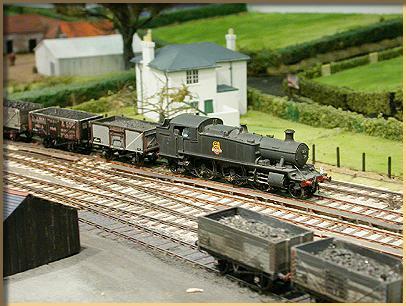 I can also substantially increase the capacity of the fiddle yard and its flexibility in operation. It is also possible to tweak the low speed running, and set the maximum speeds. So passenger trains run at 40mph while freight trains run at a maximum of 20mph. Current thinking on locos is for can motors driving High Level gearboxes. Split axles/sprung chassis are a must. I used to use Portescap motors but as time has gone on, they have been removed from engines as they go through shops. These days there are only Mashima/Canon motors in use. Goods stock is virtually all compensated, though I am finding that I can take Bachmann wagons straight out of the box, change to Branchlines/Maygib all metal wheels and new couplings stay on my track very well when pulled. Don't try pushing though. 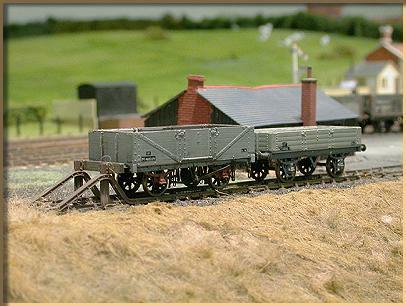 Coaches are a mixed bag, though after some early exhibitions where the super duper sprung coaches stayed at home because they would not run round the layout I adopted a more prosaic method of using standard plastic bogies with Branchlines nickel silver wheels. Coaches run in sets using Keen delta shaped couplings. They run very well. Automatic couplings are Alex Jackson. 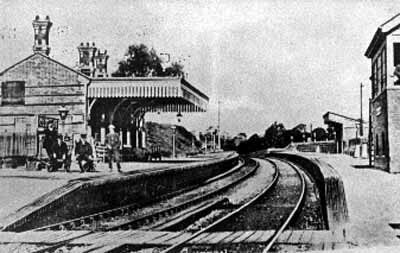 Clutton Station looking up towards Bristol c 1915. Staff pose for the photographer. This picture is prior to the construction of the parcels shed. 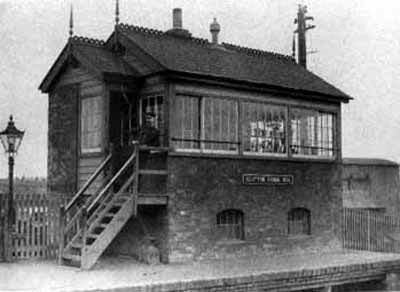 The crossing loop was installed with the improvements in 1895, along with the Type 5 signal box. The point rodding is under the cover in the middle of the track. Oil lamps can be seen. 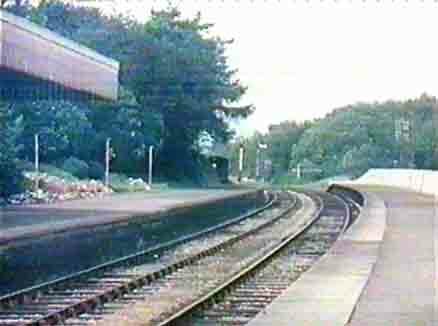 The well known photograph of Clutton Station looking down. The station masters house can be seen peeking around the station building. Some of the staff can be seen. 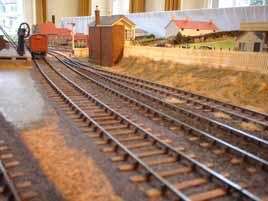 A rake of wagons can be seen standing in the down sidings. The down starter, and down main to siding starter can be seen. Note the inside keyed track on the up line (the track on the right). 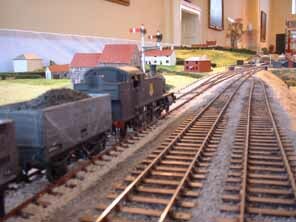 A view from the signal box looking down with a large prairie passing on down empties. This picture taken in the early '60s shows the final down starter, with a ground disc at its foot. There are some wooden-bodied wagons in there, but the majority are steel 16-tonners. A rather poor photograph looking up from the down platform, after closure to passengers. The poles are for hanging oil lamps from. The running in station name boards have been removed. 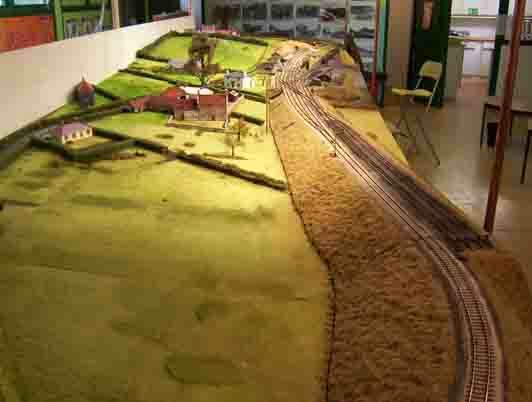 A map of the village and station can be found at the Somerset County Council site. A picture of an electric key token can be seen at Chris Osment's site. Details of the village and its attractions are on its home page. Batch Farm is on the hillside behind the station's fir trees. 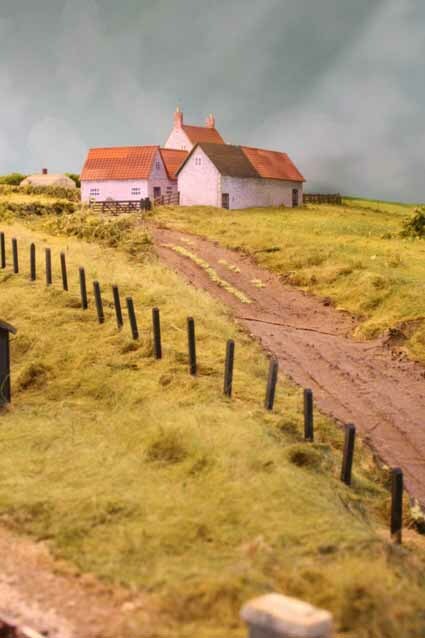 It was created on the computer, with a bit of editing of photos and Wills plastic roofs. The farm operated into the '80s, but has now ceased. In the foreground of the Farm is the site of Burchells Colliery, which is why this is broken ground. A modern housing estate now covers this area, though the farmhouse is still there. 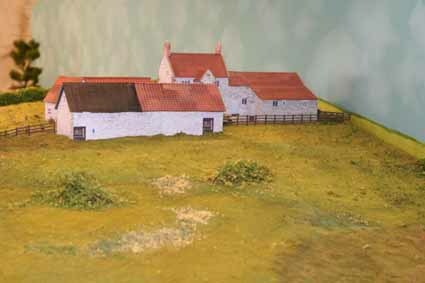 The other farm modelled is Churchlands. This farm shows signs of modernisation compared with Batch, it has a new asbestos storage shed and a tractor. Behind is one of the houses on the Moorsfield estate, an estate put up by the Rural District Council. The farm ceased operating in the late '60s, the land appears to have been sold off for development. The farmhouse is still there, but surrounded by new houses. Part of my model looking up. This shot taken April 2007. Marcrofts wagon works out-station is on the extreme right. A housing estate (Greenridge) has been built on the field behind the station, that the cows are grazing in. The station looking south. Batch Farm is on our right, with the site of Burchells Colliery in front of it. Rabbits are at work in the scrub land here. This area has now been built over, and a children's playground is on the right. You can't see it, but through the window to our right is the real Clutton station. Picture taken before the addition of new trees. 4131 on the 5.00pm up coals from Radstock has been brought to a stand at the up home. Once the yard signal (on the right) has been pulled off, the train will be eased into the yard. This signal can only come off when the road has been correctly set. 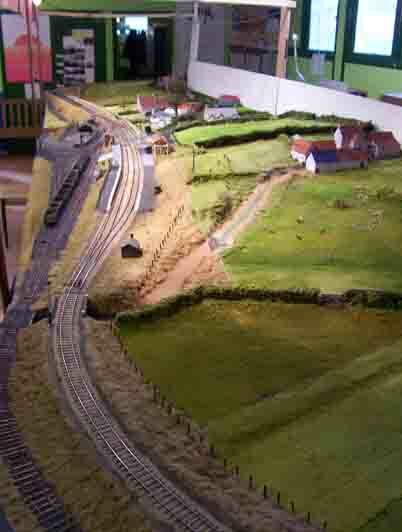 When the points have been reset behind it, it will reverse back down the yard into the relief siding (the middle road in this picture) (Railwells 2001). Early days of construction of one of the middle boards, showing the honeycomb card, overlaid with more card. 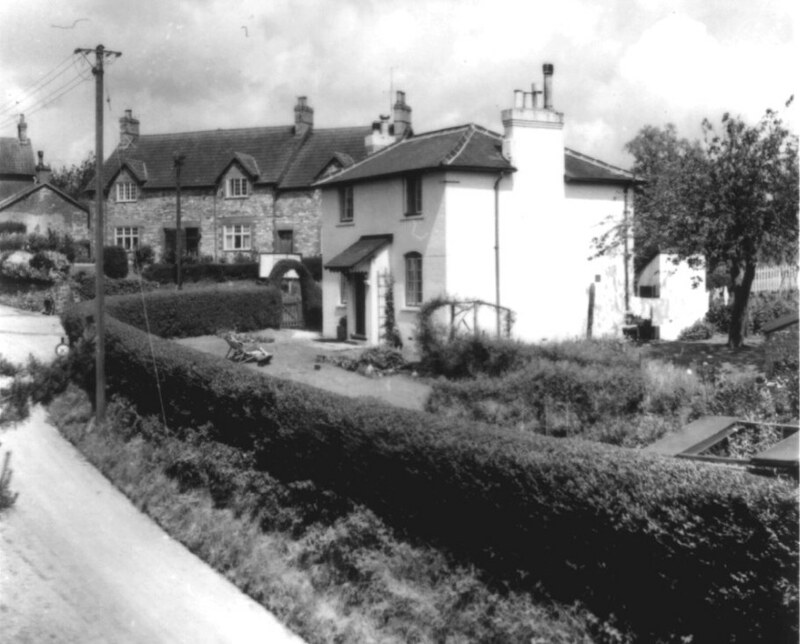 Churchlands Farm on left with the Station Master house to the right. Station Road in middle (03/01). Almost the same area from a different angle in June 2002. 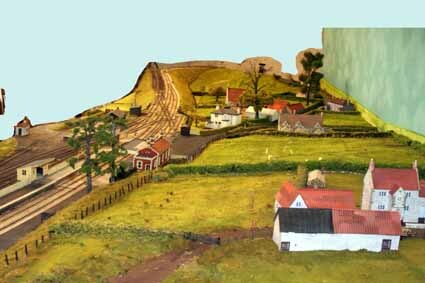 The station master house is a mock up in this picture. 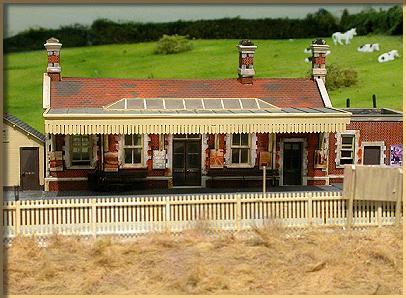 The Station Master's house, built from pictures that came my way. 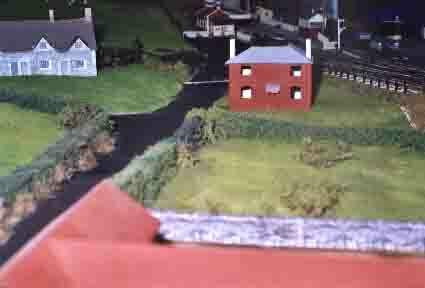 Behind is a mock up of the station cottages. Churchlands Farm with the Council estate behind. 4131 blasts past the up starter with an up freight. The Scout hut is now in the area on the right of the picture. 8744 on a down passenger has passed over Station Road bridge, passing Churchlands Farm. The farm appears to have ceased activities in the late '60s, the land being sold off for housing. 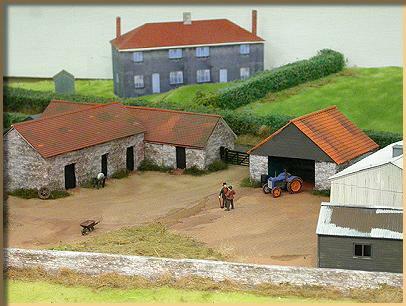 The farmhouse is still there, much altered, the ancillary buildings have either been demolished or are in use as garages. 8744 arrives on yet another down passenger at Clutton. 4131 on another up freight. In the foreground is Clutton Church, behind is Churchlands Farm. To the right is all housing now. A shot from the balcony at Scaleforum, on the right is the lever frame and stool, King Lane Bridge. Shot on the Down Platform. The signalman Harry Dando has the token in its carrier loop and is talking to the stationmaster, Mr. Nailor. 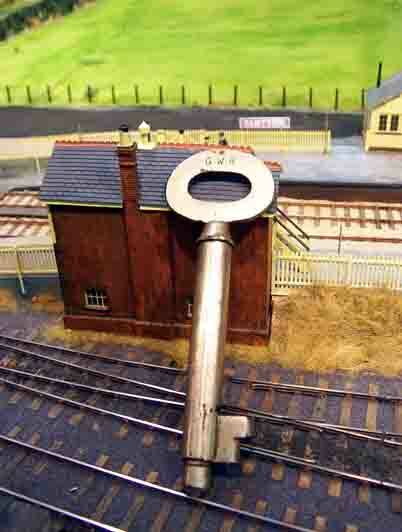 The actual key for Clutton Signal Box (closed 1963) propped up against my model signal box. Gives some idea of the scale of things. Rear of the box from the yard. Pictures of the specific yard crane I want are very difficult to come by. This model is only an approximation of the crane, awaiting decent photos, maybe a drawing. Long shot of station. All the area on the left has been built over these days. Churchlands Farm is the nearest group of buildings. Behind that is Station House, with station cottages behind that. Right on the horizon is Batch Farm. Scenery is rather unfinished at this stage. The non railway buildings were mock ups, to try and get a feel for their size. About an afternoon produced all the buildings out of corrugated cardboard, spray paint on the roofs. I also had a go at producing stone paper. I have produced some better mock ups since this picture. 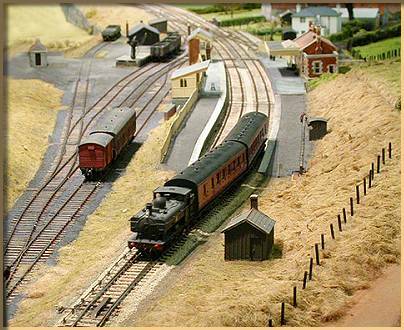 For comparison here is the same scene at Clutton at Clutton on 16/10/04, with new buildings. Low shot of the station building from the yard. Clutton is operated to a timetable. I was lucky to be able to obtain the working timetable for my period. For operation though, the trains run to a sequence. The first step in constructing a sequence was to create a time and distance graph. I found out that some trains did the loop from Temple Meads, via Radstock, Frome, Witham through Wells up to Yatton and back to Bristol. Constructing the graph enabled me to work out what was going on and what trains crossed where. Having access to the working timetable also gives train lengths, speed restrictions, local engine restrictions, signal box opening times. There are a lot of tank engines and B sets, but that is exactly what you would have seen in the '50s. 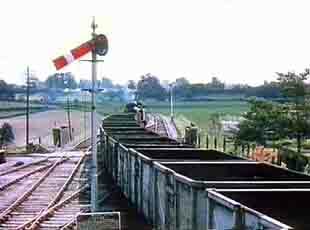 Freight was also important, with coal from the Somerset collieries that were connected to the line passing through. The principal Up freight was the 5.OOpm ex Radstock which had to lie over at Clutton, while several passenger trains passed it. There is also the 5.55 Up Channel Islands Boat Express, usually a pannier tank and B set! This train connected with the one from Weymouth, only stopped at Radstock and Pensford, passing Clutton at reduced speed to pick up the token. It was followed, in the 1950s, by a diesel railcar, stopping at all stations. At one point in the timetable it is possible to have 3 trains in the station. Down freights sometimes shunted at Clutton, dependent on traffic. A 1950 rule book is absolutely necessary. It was revised in 1961. The 1936 GWR general appendix was still in use. It was replaced by 2 books, the 1960 general appendix and the 1960 regional appendix. The 1936 GWR signalman's instructions were still in use, replaced in 1960. The 1948 sectional appendix, the one I don't have, I only have the 1960 appendix. Working timetables for the appropriate year. Click here for the 1956 freight and here for passenger. The coach working instructions for the appropriate year, these tell you what sort of coach, but not which particular coach. I have one for the forties, and I need to have 11 (yes eleven!) sets of coaches to run a service. Is it really necessary to have all these instruction books? Yes, if you want to run a railway, rather than play trains. There may not be lives at stake on our models, but atmosphere is derived from correct operation. There then was the task of working out what the trains looked like. Here I was reliant on photos. Unfortunately, photographers often don't record the date of their photo, let alone the time of the train! Some photographers were exceptions to this. I was reduced to looking at the direction of shadows. So for example, I have plenty of photos of the 5.00pm up Radstock coals. I have one photo of the 2.5pm down freight by looking at the shadow. I have a part photo of the 11.25am up freight. I do not have a photo of the 8.32am down. Photographic emulsions were not so fast then. Photographers did not have so much free time, and film was relatively expensive. They took their photos in good light later in the day. I created a table of prototype photo references. These train movements and their formations affected how the fiddle yard is constructed, and how many roads were needed. When I came to designing Clutton, I was inspired by the reading of the late Mike Sargent's articles on the control of Bodmin. I set out to try and see if I could do something similar. 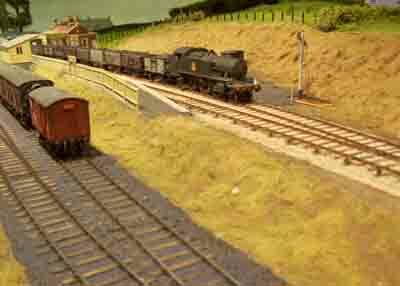 Clutton comprises a passing station on a single line – in model form it became a station with a passing loop at the front and a fiddle yard at the back – in the form of a dumbbell. 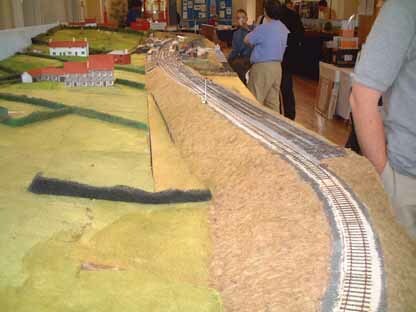 I thought long and hard about what irritated me most observing other layouts and exhibiting and operating layouts. Exhibiting puts enormous strains on the operators and I wanted to reduce this load. The main problem I saw was the operators being asked to do too much, i.e. they had to set routes, often through a multitude of points, set section switches and maybe signals (dependent on the layout). Once the train had passed, they were required to reset the route, signals and section switches to the off position. The results of operators being asked to do to much were seen with derailments at incorrectly set points, engines moving that were supposed to be off and fingerpoken troubles of sticking engines, found to be a section switch or route incorrectly set. This is a subject I personally find of great interest. Amazingly little has been written in the model press on designing in reliability with notable exceptions being an article by WE Ward-Platt (Railway Modeller, October 1965) and Stewart Hine (Model Railways, February 1976). I found inspiration in the prototype – where interlocked lever frames with block instruments relying on the interaction of two people resulted in high reliability. 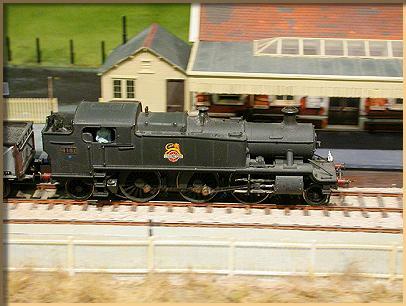 Clutton's Block Instruments have eliminated section switches on the layout. As this is a single line, I made imitations of the Key Token Instruments, which comprise 3-position wafer switches and a bell key switch (a standard microswitch). 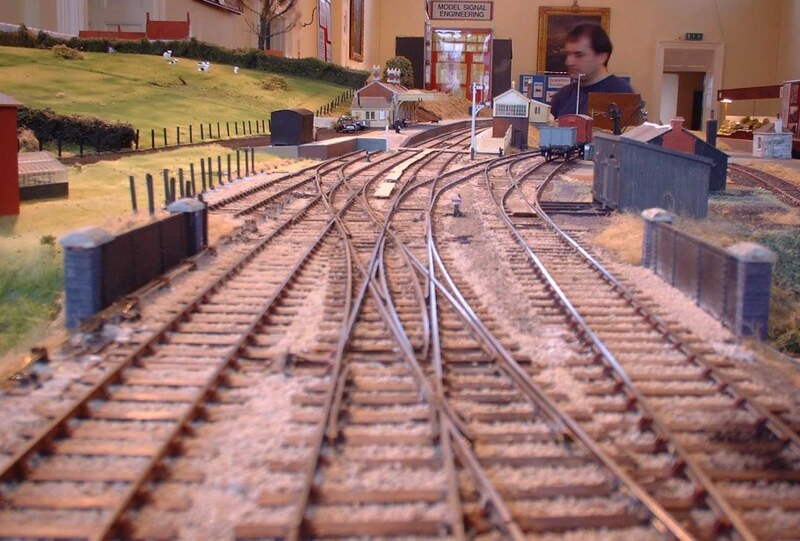 Instruments are duplicated in the fiddle yard and station box (lever frame and station box are out on the front of the layout for the visitor to see). The wafer switches control a relay logic system that replaces ordinary section switches. So instead of throwing a series of switches in sequences, the wafer switch, dependant on what position it is in, selects different combinations of sections. For shunting purposes, providing both token instruments show "token in", a strategically placed switch overrides all sections in the station. Should either token instrument be moved, the shunting switch is isolated out. Consulting the photographs, you should see subtle differences between the instruments at the station and in the fiddle yard. 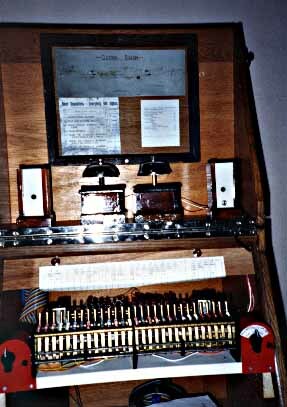 In operation, when a train is accepted by the far signal box, the operator turns the key token instrument to the appropriate "key out". In reality a token is issued, I did not see this as feasible, so a positive indication is given via a meter, which represents the token. 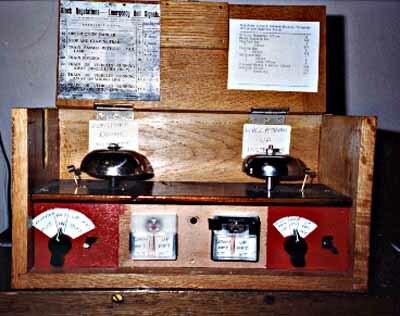 In the station, the starting signals are interlocked with the token instruments, a post-1948 amendment, not strictly correct for GWR practice before this period. It was recommended in the inspector's report of the Abermule disaster where the token was given back to the driver for the section he had just traversed. It wasn't put into practice at all locations. How is this done? The diodes ensure that should the switches be incorrectly set, the relay will not energise and the meter will not release the token and the train cannot therefore be driven into the section. The relay logic is shown in simplified form for a passing loop. A split potential power supply is used, and the double pole wafer switch selects between either side of the split supply. Does it work? It meets the criteria that I set out at the beginning, while being enormously satisfying to operate. 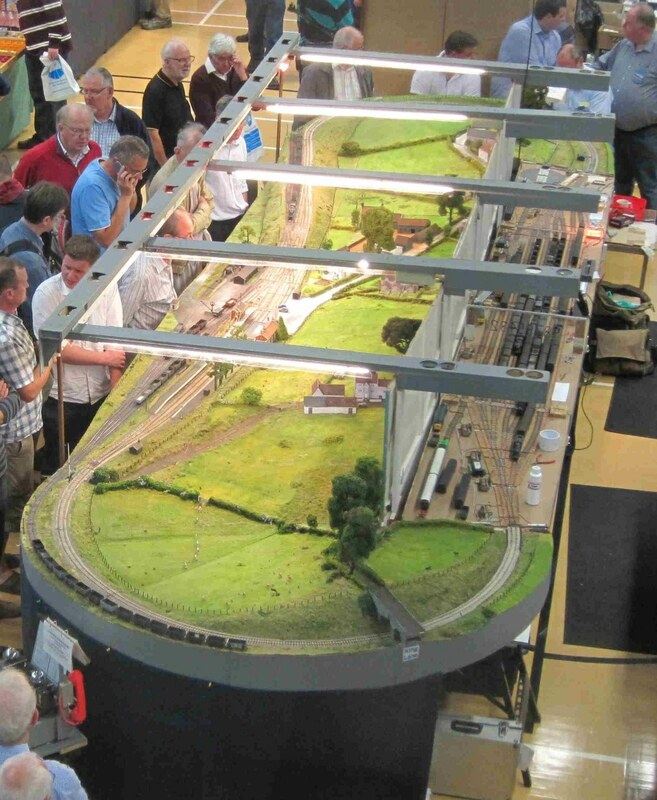 At its first exhibition outing (Railwells '93) the layout was very well received, and the crowds around the station box vindicated my attempts to put the operator out in the thick of it. It is also great fun to operate, even for some BR staff that had a go! 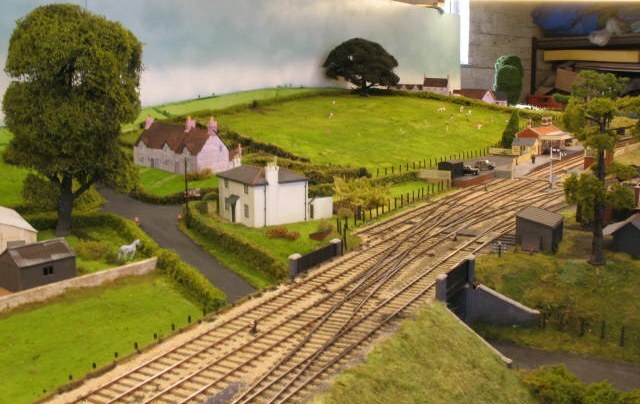 Unlike any other layout that I have operated, any green operator should be able to pick up how to operate it very quickly, as its based on prototype practice and anyone seriously interested in railways should be able to work a signal box! Recently the adoption of DCC means that operation has moved nearer the prototype, I am no longer constrained to run the track. I have left these pages as they show the principles I adopted for conventional wiring. Station box and interlocked lever frame. The bells are connected to the pushes in the fiddle yard control shown below. 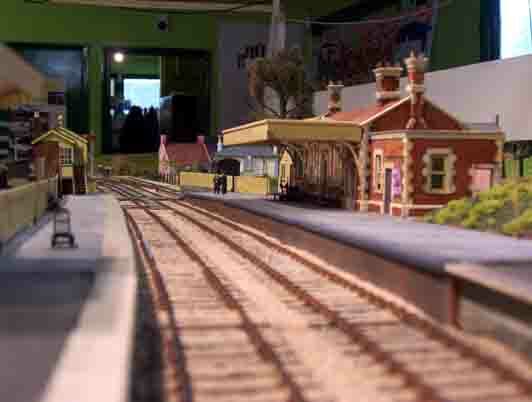 A fiddle yard is where one 'fiddles' with the trains, but most trains run round as sets, and no 'fiddling' takes place. The Staging Roads from the church end. There are nine roads, with a couple of sidings off at this end and a turntable (on the right).The point motors are ex-GPO relays, modified to drive the point stretchers and utilising their built in switches to change the crossing polarity. Route setting and train movements are controlled by MERG units and laptop. DCC uses ROCO controllers. Picture taken at Railex 2016. The Staging Roads from the other end. Following a comment by Iain Rice, the backscene was extended at this end. The main line at the bottom is laid in concrete sleepers. Picture taken at Scaleforum 2011. 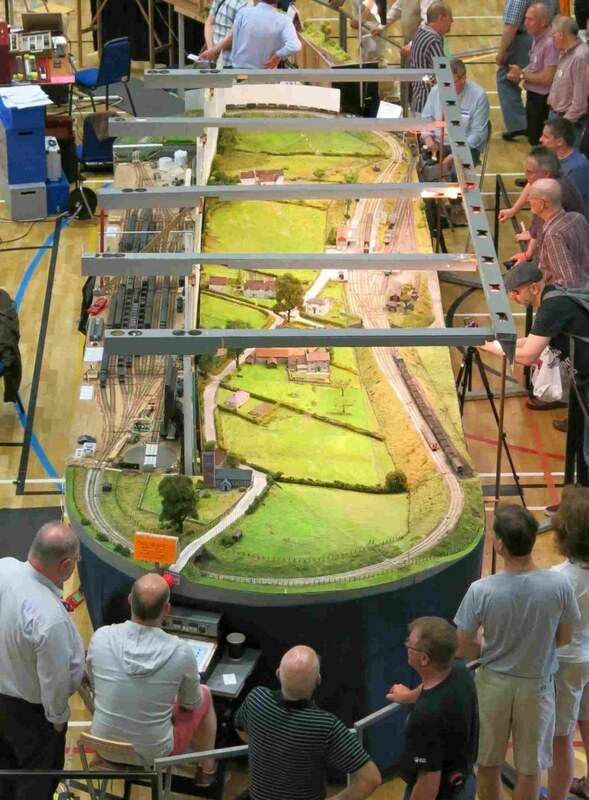 I started to build Clutton in 1989, so at Railwells 2018, it will be 29 years old. 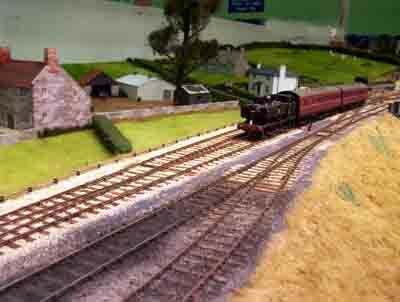 Clutton also appeared on the Railway Channel DVD No 1 and the Steam Era Model Railway layouts Volume 6. There are a number of videos on Youtube, just search on Clutton.